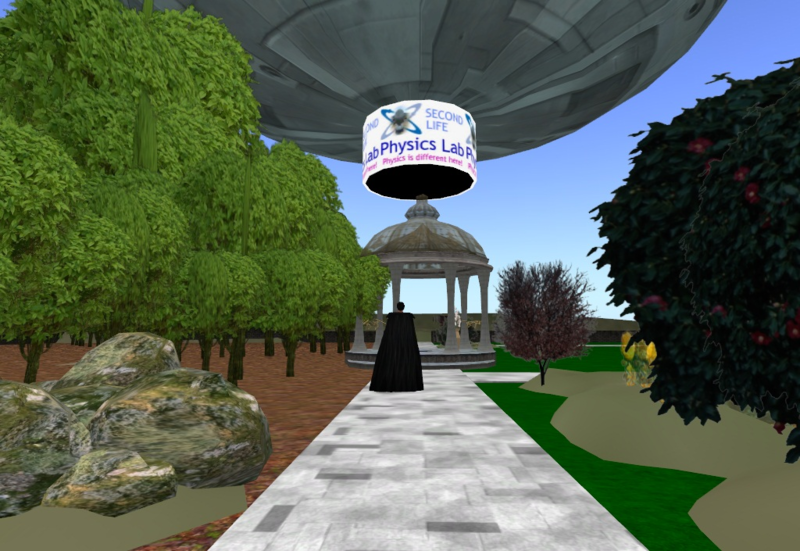 Explore the Second Life Physics Lab! 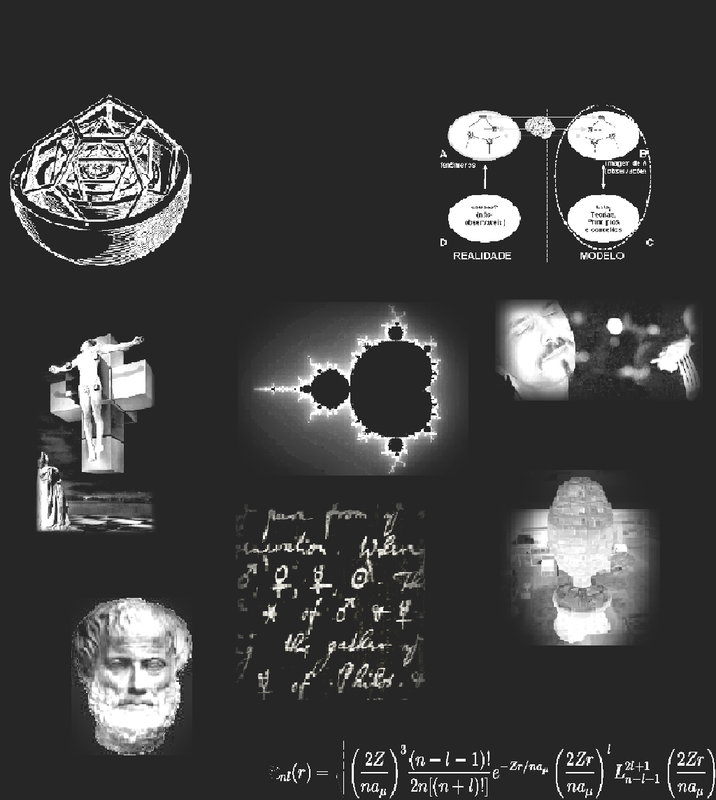 Back in 1980, Papert proposed ‘physical microworlds’ (Papert, 1980), where, before being receptive to Newton's laws of motion, students could learn some other laws of motion, not as complex, subtle, and counterintuitive, build alternative laws of motion, evolving from the historically and psychologically important Aristotelian laws through the ‘correct’ Newtonian ones to the more complex Einsteinian ones. 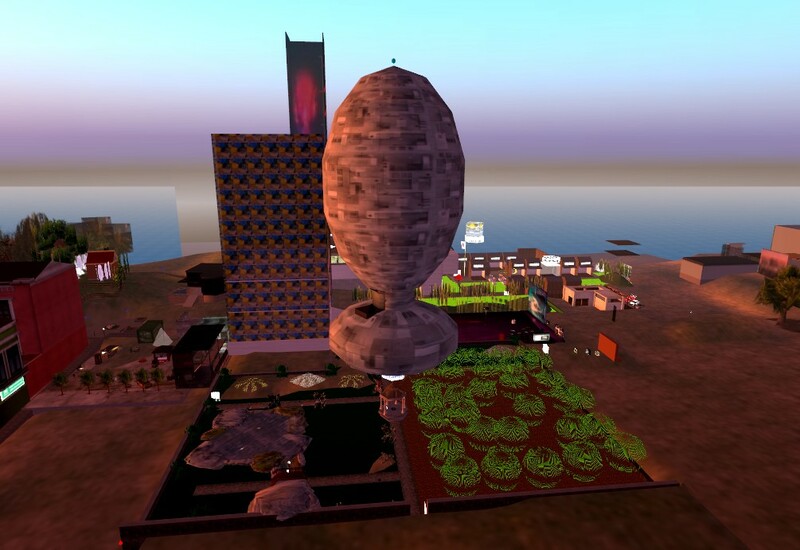 Second Life users can walk around, enjoy the 3D scenery, fly, drive cars and other vehicles, interact with other avatars, play games, or create complex objects, with many different textures, such as chairs, clothes, jewels, vehicles, guns and even entire buildings. For Doherty et al. (2006), we can use these environments to place appropriately sized avatars to freely move around and examine and interact with objects and phenomena in three dimensional simulations of the difficult to comprehend worlds of the very large, such as planetary systems, and micro environments of cellular and even nanoscale worlds in which the avatar can ‘enter’ to observe it ‘from inside’. I became interested in this new technology and started to create a microworld, a laboratory within the virtual environment Second Life to investigate its use. Feel free to visit my Second Life Physics Lab! Aiming for wider dissemination to the youth community who attends the SL, as well as taking in account the strongly visual game culture of many of its users, it was set as a 11-floor 'space station'. Meanwhile I found that the Physics implemented in Second Life is hyper-real (dos Santos, 2009) and does not correspond to the real world Physics nor to Galilean/Newtonian “idealized” Physics. Far from considering it as an obstacle to its utilization as simulation environment for Physics learning, however, I consiedered that this same irreality can be used with advantage in building simulations where the physical laws are different and changeable by the students, in a ‘surreal’ microworld, recovering Papert's (1980) proposal. Therefore, I'm building simulations for Physics and Math teaching, microworlds that offer suppport to experimentation with different physical laws, as proposed by Papert (1980), while promoting virtual environments as teaching tools. To investigate the feasibility of building devices that do not follow the laws of Newtonian Mechanics in Second Life, I built a ‘cannon’ controlled by a control panel with two buttons: one causes the projectile to perform the parabolic trajectory predicted by the theory of Galileo / Newton while if the other button is touched, cannonballs are fired following a path which approximates the one predicted by Buridan's Impetus Theory de Buridan (13--, apud Crombie, 1957, p. 251), prevalent in the Middle Ages. The operation of this ‘cannon’ can also be seen in the videos above or experienced in the microworld Second Life Physics Lab. Despite being very simple, this cannon, as far as I could ascertain, is the first device in Second Life that realizes Papert's (1980) that provide experimentation with physical laws different from Newton’s ones. See (dos Santos, 2011c) for a more detailed description. I have also built a Physics gamesim, a simulation that includes the motivational attributes and the rule-based element of games (de Freitas & Levene, 2004), inspired on the Lunar Lander computer game, launched in 1975 with the programmable calculator HP-25 (“Moon Landing Simulator for the HP-25”) which was based on the 1969 Lunar Lander, created by Jim Storer (Edwards, 2009). This classical game, besides having been one of the earliest computer games (Edwards, 2009), was also one of the earliest space simulation programs (Chien, 1994), created just months after Apollo 11 astronauts Neil Armstrong and Buzz Aldrin actual moon landing on July 20th, 1969 (Edwards, 2009). In all variations of the game, the player is aboard a lunar module free falling to the rocky moon surface with a limited amount of fuel. He has to portion the fuel and use a proportional throttle to adjust the strength of the thruster so as to land the module safely without crashing. The simulator calculates its velocity and height as the lunar module descended and informs continuosly the vertical speed and height from surface, as well as the remaining fuel supply, as one sees in the figure below. If the player lands at a velocity below a certain limit, the mission is considered a success. If on the other hand, it lands with to much speed, the simulator informs the velocity with wich the module crashed on the surface. After a few attempts, the new player discovers that, to be successful in this serious game (Abt, 1970), he has to master the physical concepts of force, acceleration and velocity, as well as their interrelations – Newton's Laws, in short – to be able to land safely, overcoming this way the generalized difficulty in distinguishing among these concepts (see, for example, Trowbridge & McDermott, 1981). The operation of this lunar lander can also be seen in the videos above or experienced in the microworld Second Life Physics Lab. See (dos Santos, 2010d) for a more detailed description. 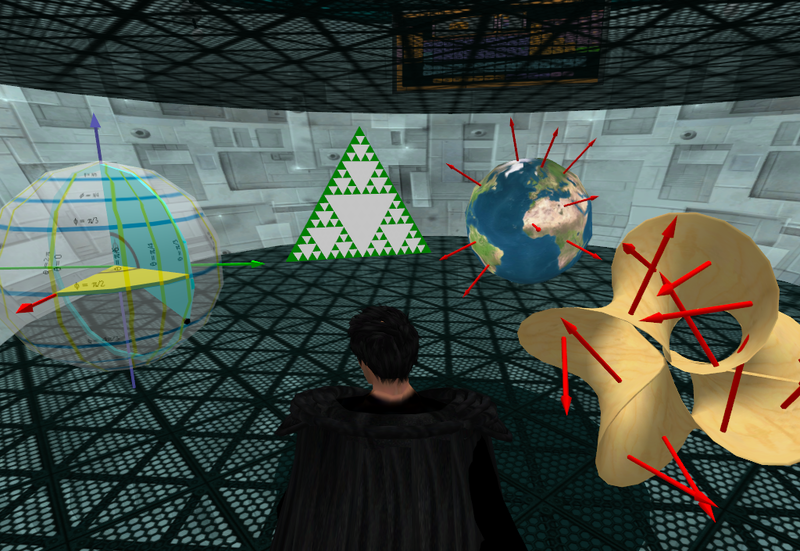 There is also a few Math simulations on the 2nd floor of Second Life Physics Lab. See (dos Santos, 2012 for a more detailed description. Second Life Physics Lab: Physics is different here!. VEJ - Virtual Education Journal, v. 2, n. 3 (special issue: Got Game? Let’s Play! ), pp. 68-73, Feb. 2013. The Amiable Text Interface for Second Life that translates commands in a simple form resembling Logo into LSL commands that generate objects following alternative physical laws, similar to Papert's turtles (1985) or, even better, to diSessa's Dynaturtles (ABELSON; diSESSA, 1981). 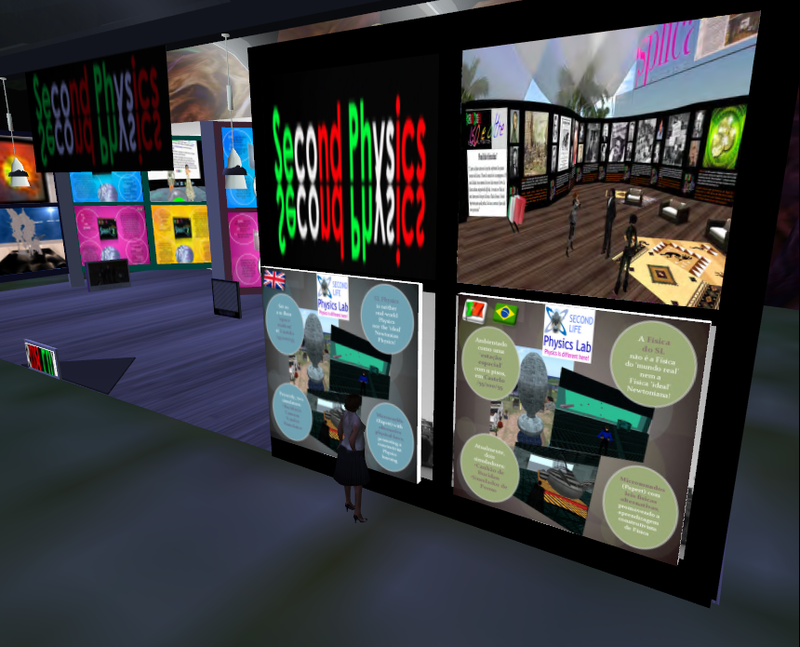 Second Physics: Popularization and Outreach of Science in the Italian Second Life Community. (c/ Calliope Lexington, Talete Flanagan, Marjorie Fargis, Swina Allen e Giovanna Delphin). Presented at VWBPE'11 - 2011 Virtual Worlds Best Practice in Education and published in Journal of Virtual Studies, special issue 2011 VWBPE Conference Proceedings, 2011, v. 2, n.1, p. 19-24. Second Life Physics: Virtual, Real or Surreal? 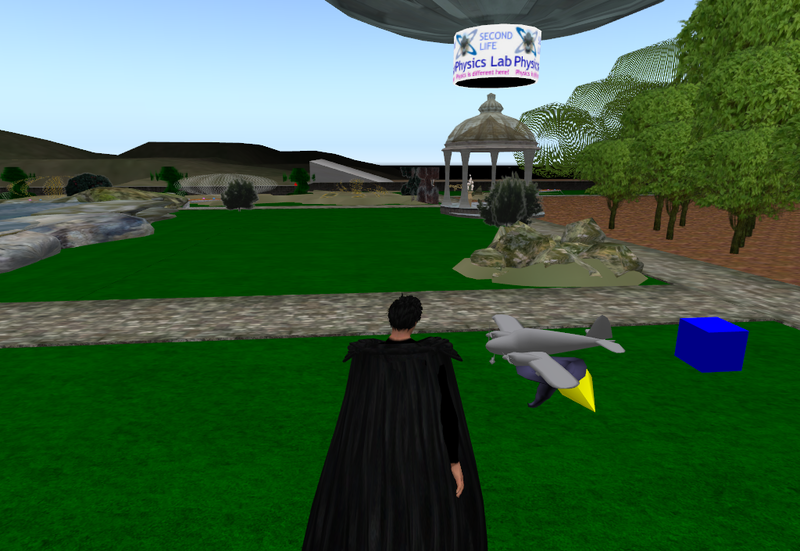 Journal of Virtual Worlds Research, v. 2, n. 1, (special issue: Pedagogy, Education and Innovation in Virtual Worlds), Apr. 2009. Abt, Clark C. Serious games. New York: Viking Press, 1970. Chien, Philip. "Blast off!". Compute!, n. 166, p. 90, Jul. 1994. Crombie, Alistair C. Augustine to Galileo: the History of Science a.d. 400-1650, London: William Heinemann, Ltd., 1957.
de Freitas, Sara; Levene, Mark. An investigation of the use of simulations and video gaming for supporting exploratory learning and developing higher-order cognitive skills. In: Kinshuk; Sampson, Demetrios G.; Isaías, Pedro T. Proceedings of the CELDA 2004 - Cognition and Exploratory Learning in Digital Age (CELDA'04), Proceedings of the IADIS International Conference, Lisbon, Portugal, 15-17 December 2004. Lisboa: IADIS - International Association for Development of the Information Society, 2004/12, p. 35 42. Doherty, P. D., Rothfarb, R., & Barker, D. (2006). Building an Interactive Science Museum in Second Life. In D. Livingstone & J. Kemp (Eds. ), Proceedings of the Second Life Education Workshop at the Second Life Community Convention, San Francisco, August 20th, 2006 (pp. 19-24). Paisley, UK: University of Paisley. dos Santos, R. P. (2009). Second Life Physics: Virtual, Real or Surreal? Journal of Virtual Worlds Research, 2(1). dos Santos, R. P. (2010a). Second Life Physics - Cannon simulation Part 2: Newtonian Law. dos Santos, R. P. (2010b). Second Life Physics - Cannon simulation Part 1: Buridanian Impulse Theory. dos Santos, R. P. (2010c, July 30). 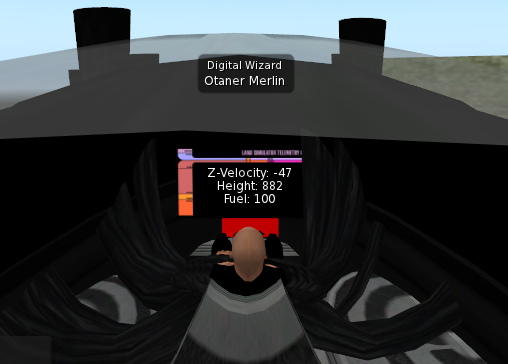 Alternative Physics in Second Life [Web log post]. dos Santos, R. P. (2010d, December 17). Lander Simulator in Second Life Physics Lab [Web log post]. dos Santos, R. P. (2012, April 27). New Math additions to Second Life Physics Lab! [Web log post]. Edwards, Benj. Forty Years of Lunar Lander. Technologizer. Jul, 2009. Papert, S. (1980). Microworlds: Incubators for Knowledge. In ______. Mindstorms - Children, Computers, and Powerful Ideas (pp. 120-134). Basic Books. Moon Landing Simulator for the HP-25. Trowbridge, David E.; McDermott, Lillian Christie. Investigation of Student Understanding of the Concept of Acceleration in one Dimension. American Journal of Physics, v. 49, n. 3, p. 242-253, 1981.